Behind the Myth of the Scandinavian Utopia, Michael Booth, Picador. Anyone with even a little experience traveling abroad realizes that, for the most part, aside from goofy hats and surprising pizza toppings, people around the world aren’t much different. No one likes to wait in line. However, there have been a number of studies which suggest that even suffering through the most interminable line at Legoland is not enough to ruffle the feathers of your typical Scandinavian vacationer. Not only are the northernmost inhabitants of our planet allegedly unflappable, there is enough data to fill a fjord that suggests: nowhere will you find happier folk than in Nordic climes. At the outset, Booth notes that considering the idea that Scandinavia is a bastion of happiness and harmony is a challenge. For one, the rest of the world knows very little about the people living there. ABBA might be a global phenomenon and Björk an alternative-rock icon, but it doesn't mean that everyone in Sweden is clad in white, spangled jumpsuits or the denizens of Iceland exist in some whimsical/disturbing videoscape. Over the course of 400 pages, Booth takes the reader on a journey through Denmark, Iceland, Norway, Finland, and Sweden, giving each country its moment in the spotlight. 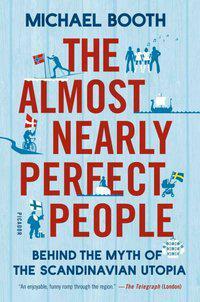 With a thousand-plus years of sometimes intermingled history having shaped the psyche of these countries and how they relate to one another and the world, “The Almost Nearly Perfect People” could have easily become bogged down in detail, but Booth nimbly keeps things moving. To compile this travelogue, Booth interviewed academics and officials, but also spent considerable time roaming the cities and countryside, interacting with the average Finn or Icelander. The results of the latter encounters are often amusing, as when Booth attempts to draw random Swedes out of their usually stoic shells, or when he navigates the etiquette on a visit to a Norwegian sauna. Booth celebrates the region’s successes — top-rated educational systems, all-encompassing social safety nets, social stability and mobility — and also examines the struggles, which include maintaining those social programs and the challenge of integrating immigrants into largely homogenous populations. If not utopias, there is ample evidence that the Nordic nations which Booth explores have numerous reasons to be the envy of the world. Some of the achievements are arguably the product of fortuitous circumstances; namely, the isolated environments and small, closely-knit populations. However, there is little doubt that these countries have also figured a few things out about creating societies which serve the greater good of their populations. Are the peoples of Scandinavia happier than you and I? It likely depends on which of their citizens you ask, but it's probably a safe bet that even Björk doesn’t enjoy waiting in lines. How to Survive the Titanic—Or the Sinking of J. Bruce Ismay, Frances Wilson, Harper.